The winning spellers of the “Church Ladies” team, posing here with “Dolly Parton,” are Leslie Runion, Karen Montgomery, Gladene Johnson, Jennifer McCombs and Judy Hughes. 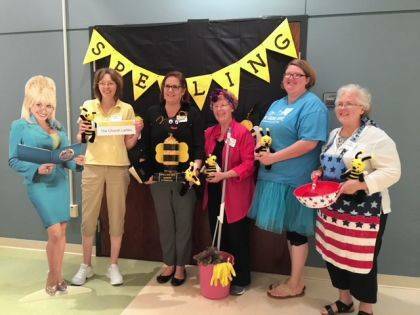 The Champaign County Children’s Literacy Foundation held an Adult Spelling Bee on June 1 at Urbana University. The event was well attended and lots of fun. Participants enjoyed a free taco bar during the many rounds of masterful spelling. The final two teams were Triad Local Schools and the “Church Ladies” of the North Lewisburg United Methodist Church. In the end, the “Church Ladies” won it all! The fun-filled evening brought in around $4,000 for the Dolly Parton Imagination Library Program for Champaign County children. A very warm thank you to all the sponsors who made this event possible. The event was also the kick-off for our “Traveling Dolly Campaign.” Businesses can request our life-sized cutout of Dolly to make an appearance at their office or business for a suggested $25 donation (which supports one child in the DPIL program for 1 year). The campaign is a fundraiser for the Dolly Parton Imagination Library Program and a way to boost the awareness of the program in our community. People are encouraged to take pictures with Dolly and post to Twitter using the hashtag #whatsdollydoing (please also tag @FoundCCC and @readimaginesoar) for a chance to win a prize at the end of the campaign. Please check Twitter frequently and see and share all the places in Champaign County that Dolly is visiting! The Champaign County Children’s Literacy Foundation ended the school year with group activities for the mentoring programs at all five school districts in the county with students completing service projects and art projects. We are in need of new mentors for the upcoming school year. For additional information on how you can support the Dolly Parton Imagination Library Program for Champaign County, to request a visit from Dolly, or to become a mentor for next school year, please contact Jennifer Harvey at Jennifer.harvey@mccesc.org. Submitted by the Champaign County Children’s Literacy Foundation.